Pamper yourself with our signature salon services in a relaxing environment. Whether receiving our signature manicure and pedicure or a new hairstyle, our salon professionals will help you look as beautiful as you feel. Our talented stylists are here to give you the best experience! Blowout, Hair Styling, Makeup Artistry, Nails, Skincare, Waxing, and more; we provide them all with our signature techniques to make you look and feel your very best. 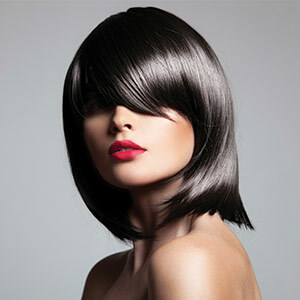 Our wide selection of luxury salon services is provided with high-quality products and the latest training! Having the right haircut is more important than simply having your hair cut. The stylists at Sassy know that your individual features, personality and life-style needs are what should dictate your style. Our stylists know the length and shape that flatters your face and highlights your bone-structure; they know how to use layers, textures and techniques to emphasize your physical beauty as well as your confidence, so that your personality and your individual beauty are always what capture attention. Sometimes a little extra change is needed to help maintain the look and feel of effortless style. Our perms, mild relaxers, keratin and reconstructors combined with their top quality after care products, change the nature of your hair so that you can easily recreate a flawless look day after day. Want loads of shine? Tresses that stay sleek in the highest humidity? Whether you desire silky smooth locks, masses of curls, complete control, or stronger healthier hair– your style is with Sassy. Have a need for help with your bridal event? We have the experience to handle trending and classic hair and makeup styles for your bridal party. We also participate in regular fashion events rocking the latest styles. But don’t take our word for it—come in and check us out! Look your best for that special event. Whether you visit our salon or need us to come to you, we’ve got you covered! Treat yourself to a manicure and pedicure at Sassy Hair Salon. Nail Art, Acrylic and gel nails are offered. Manicure, pedicures, Shellac and so much more—we can meet your beauty needs. Need smooth results? Let our waxing experts give you professional waxing or eyebrow tinting! Everyone wants less time getting ready day-to-day. Add some salon lashes to your look, and take mascara application off your list of to do’s.